Unlimited Wireless Muve Music Service! What's Muve Music? 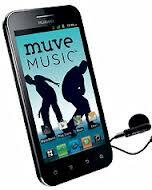 Muve was the first unlimited music service to be bundled with a wireless plan. In this case, it was a concept born out of Cricket Wireless as a strategy to differentiate its service from other prepaid wireless carriers. Cricket was able to enlist the participation of all four major music labels to license content to the service. The service launched in January 2011, and after only a couple of years, it was able to hit the 1 million user mark, and is steadily rated as second in usage only to iTunes. It has been quite popular, with its users consuming ~40 hours per month, which equates to roughly 300 songs; i.e. people like it and are using it! Muve ultimately reached 2 million users, and was spun off and sold to Deezer in January 2015. Deezer converted it to a paid monthly service under its own brand, and killed off the Muve brand. I've kept this page here to preserve its history for wireless and music aficionado! What Was So Great About Muve Music? The fact that you could access millions of songs through any Cricket phone (it launched only on specific phones, but was later rolled out to all Cricket phones), and it didn't count towards your data allowance was pretty slick. In today's environment this doesn't sound so unique, however, in its day this concept was very innovative (keeping data consumption of a particular app outside of the plan's data allowance). The unlimited music service was particularly innovative in that they were able to develop an encryption and compression methodology that doesn't tax the wireless network, while providing fast and quality music in real time to the phone. It also involved a unique business model with artists and labels who were used to Apple's per song compensation model. With an unlimited service, new terms needed to be created and agreed to, which is never an easy feat, particularly in the music industry. Getting songs to your phone was all done Over-The-Air (OTA), so no syncing, no cords; it's all wireless. If you damage or lose your phone, your music was automatically backed up, and could be easily downloaded to your new phone. You could manage your music from a Web interface if desired. You could make music you've downloaded into your ring tone. You could multi-task on your phone while listening to music. i.e. Changing to another app didn't pause the music. This was very unique for a music app at the time, and a fantastic user experience. My DJ feature would create play lists for you based on what you've already downloaded; if you liked a play list, you could save it and edit it to your liking. Again, a unique feature at the time. 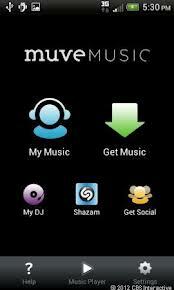 The Social feature allowed you to share music collections with your friends and download their favorite songs. With the integration of Shazam, you could have the app identify a song on the radio for you, and then download it to your phone if desired. You didn't need to have wireless coverage to play songs you'd already downloaded. Obviously not possible with streaming services. What Was Not So Great About Muve Music? You needed to use a special Cricket-provided micro-SD card that enabled access to the music to be encrypted, such that it couldn't be transfered to any other non-Cricket phone or device (including PC/MAC). Not only did this restrict how you were able to use the music, but it meant that you couldn't just go out and buy a new micro-SD card on Amazon for use in your phone for regular data storage as it wouldn't be compatible with Muve. Fortunately this restriction was later removed, and Deezer undoubtedly appreciated acquiring the technology behind this feature. When you left Cricket, you would lose access to your music. This certainly makes sense as you weren't really buying any songs, but simply getting access to millions of songs from your Cricket phone. While this made people more sticky to Cricket (i.e. it motivates them to keep the service longer), for music enthusiasts who invest a lot of time organizing their music, leaving was quite painful, to the point where they may not ever use Cricket, or use Muve, in anticipation of knowing they wouldn't be staying with the carrier for long enough to make the effort worthwhile. They would simply stick with iTunes, even though that service wasn't nearly as good a deal on a cost-only basis. In 2012, Cricket spun off Muve as a separate company, then becoming a vendor to Cricket. Why did they do that? Cricket felt that the service was so innovate and appealing, that it could offer the service to other carriers, both domestically and internationally. Keeping it within Cricket would have resulted in too much conflict of interest. This new business growth never really materialized, and AT&T quickly ditched the service in a sale to Deezer shortly after acquiring Cricket. Ultimately, Muve Music was an appealing service, particularly given that it was unlimited. Cricket played around with having it as an add-on (ex. $5 or $10 per month extra), as well as including it in the monthly service plan price. Either way, for music lovers it was a great value, and a very functional service. Given that most of us carry our phones everywhere, having the music "stuck" on our phone didn't seem like such a big deal, and was a fantastic selling point for Cricket service in general. Unfortunately, as part of Deezer it really can be considered dead. They may leverage some of the underlying technology to enable offline usage, and to offer an unlimited service, however, I've frankly lost track of it since its sale. Follow the link to learn more about No Contract Cell Phone Plans Including Unlimited!